I bought these to take as a gift for a girlfriend cooking supper…………whoops, she had to have some chocolates instead! I couldn’t resist the brown paper and those dark shapes in the shadows. Still, looking on the bright side, at least I can’t eat the chocolates. I’m getting a bit lemoned out now but I do hate waste so think there may be another in me yet! I didn’t post on Friday as I had to drop a painting off in London…………more about that later. I had to abandon our dog-walk this morning because the ice was terrible getting up the road, never mind fields. 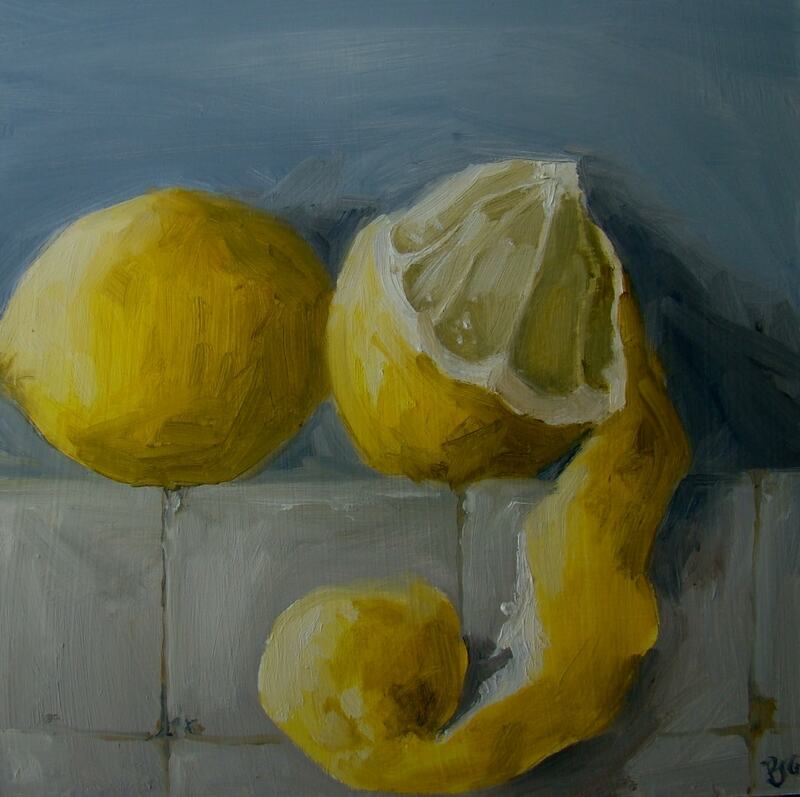 So, I came back home to paint lemons and dream of warm days in Tel Aviv when we used to pick them from a tree in our garden to slice for our G&Ts – how expat is that! Ok, that’s enough snow now thanks. It appears to be falling again here and it’s not funny any more. Meanwhile, I’ve been working on the pheasant and it should be finished by the end of the week when I’ll photograph and post it. I also managed this Dijon mustard jar and some shallots that were lurking in the studio this morning. I watched the last two episodes of Borgen last night that I’d recorded on Saturday. Love this programme but can’t work out how a Prime Minister can live in such a relatively small house and furnished from Ikea at that. Is that Scandinavian socialism at its best or the economic downturn…..hmm, maybe Dave needs to tune in. A highly topical subject today. Lemons in January. I did this quick sketch this morning before tackling the pheasant again. Bubba was quite impressed with the snow on our walk and nothing, not even snow, puts him off his main purpose in life…………to find the biggest stick and get it through the front door. We are snowed in here and I just met my neighbour whilst walking the dog to hear that the road out of our village is very dodgy which is always the case here. It doesn’t help that it’s on a fairly steep slope down into the oncoming traffic on an A road. So, fire lit, dishwasher loaded…………..is it too early for a glass of wine? No, came the reply. Still haven’t got that marmalade made! Brrrr………freezing! I have come in from the studio as it’s started to snow and I want to get the fire lit. Still, it does mean that the pheasant I’ve got hanging in the studio will last a bit longer. Bubba was very keen to get it down from the hook today so he ended up back in the kitchen. Before working on that I managed to paint these oranges which are waiting to be transformed into marmalade. A job for the snowed-in days on the horizon. I took delivery of a pheasant yesterday for a large painting so I have been busy doing mock-ups for it. Here’s a painting that sold at the Country Living fair in November which I didn’t get round to posting. Tomorrow I shall do a warm-up daily before tackling the pheasant. A first for me today………….painting in my new studio whilst it snowed outside. It was nice and warm though so I stayed in there quite happily. Trying to master my audiobook played through my Ipod was another story and brought nothing but frustration!! I think I’ve got the hang of it now so will try again tomorrow.